Three students at Olathe North High School received medals in the national Scholastic Art & Writing Awards. Renee Born, junior, received a silver medal for short story. Katelyn Gillette, junior, received a gold medal for flash fiction and Paiton Stith, junior, received a silver medal for a sci-fi/fantasty story, a silver medal for flash fiction and a gold medal for another sci-fi/fantasy story. These 11 Olathe North students were selected for the Kansas All-State Choir. They will represent Olathe North February 22, 23 and 24 in Wichita. Mrs. Waldron Recognized by 99.7 The Point and 1st National Bank with the First Class Teacher Award. Dana Baker makes National Headlines. First ever medal by a US male or Female athlete in the IAAF World Under 20 Championships. ​TAMPERE, Finland-- Americans added three medals on the second day of competition at the IAAF World U20 Championships, taking a pair in the men’s 100m, and an historic one in the women’s javelin. Olathe North Science Olympiad along with other Olathe District Schools are Successful at the Northeast KS Regional. Last month the 2018 Northeast KS Science Olympiad Regional was held at Johnson County Community College. All 5 high schools and all 9 middle schools participated yesterday in the states largest regional tournament. In the middle school division, California Trail placed 1st, Oregon Trail 5th, Indian Trail 10th, Prairie Trail 11th and Pioneer Trail 13th. These top 5 will likely be invited to participate at the state level. All total, the schools earned 45 medals in the top 6th places. Very impressive. In the high school division, Olathe North was 2nd, Olathe Northwest was 7th and Olathe South 12th. Again these top 3 will likely be invited to participate at the state level, and they earned 27 medals in the top 6th places of events. The amount of time and dedication it takes for teams to compete in an ever increasingly competitive field is enormous. The coaches deserve recognition as well as the kids. Congratulations to the following students for being selected for the KMEA Northeast District Honor Choir. They will be rehearsing and performing at Shawnee Mission Northwest on Saturday, December 2, 2017. Congratulations to Brendan Brownlee, Sophia Palcic, and Khushi Kohli as they won first place in the Math Scramble Team Competition at Emporia State University. In addition, Khushi Kohli (freshmen) placed 2nd overall in the Geometry Individual Contest. It was a great day for the Eagles! The Screaming’ Eagle Marching Band and Eaglettes Dance Team ended their competitive season on a high note at the Kansas Bandmasters Association Championships in Topeka on Saturday! This was the 3rd KBA Championship event, and featured an exceptionally competitive field of the top 22 Kansas bands. In Preliminary competition the the Screaming’ Eagles earned the Class Champion title and received the caption awards for highest scores in their class for Visual Performance, Overall Effect, and Color Guard (Eaglettes!). The band was in 3rd place overall after Prelims. In a very chilly Finals competition the band finished 3rd Place Overall and received the caption award for the highest overall score in Visual Performance! We are thrilled to have added some additional recognition to North in what has been an very successful Fall thus far for many of our athletic teams and activities. A special shout out to our 4 kiddos who marched their rears off Saturday night after having also had a spectacular morning running at the State Cross Country Meet! Thanks to Coach Huseman and Dicus for their support of our kids as well! 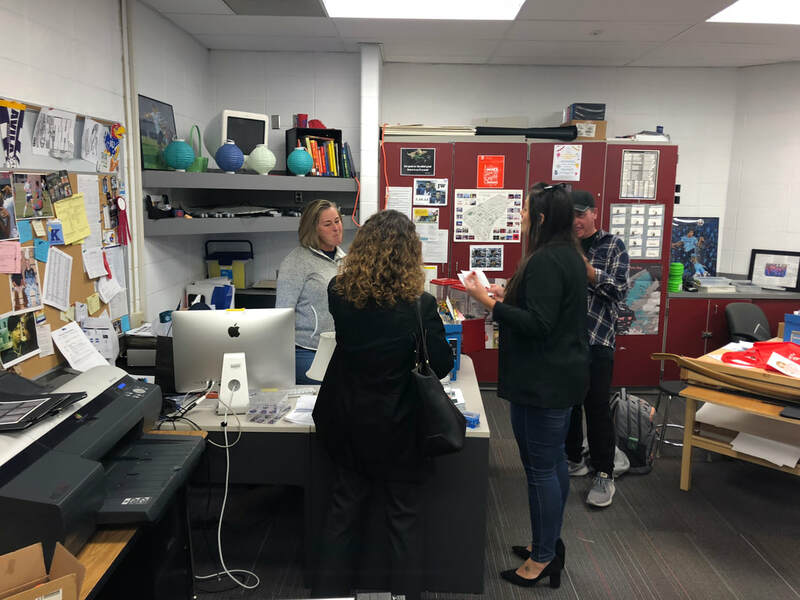 These students have worked exceptionally hard through the fall and have shown tremendous growth, and we could not be prouder of the progress they have made! Please congratulate these kids if you have them in class or see them in the hall! Congratulations to the 2017-18 Olathe North National Merit Semifinalist. Shulamimte Lim, Cheyenne Loo, and Magda Werkmeister. Congratulations to Magda Werkmeister for being recognized by the College Board as a National Hispanic Scholar as well. Congratulations! Amanda Yoksh 12th grader at Olathe North High School. She has been selected to win a 2017 Community Award, presented by the Olathe Human Relations Commission. As you may know, Olathe Community Awards celebrate businesses, civic organizations, and individuals who have made a significant contribution to enhance human rights, equality, cultural diversity and the pursuit of disability inclusiveness. For the past 15 years, Community Awards have highlighted some of our community’s most influential leaders and citizens. Congratulations on joining this prestigious group! Amanda will receive an Olathe Human Relations Youth Award which honors a youth who is 19-years or younger, attends a public, private or home-based school, a religious institution, or civic organization in Olathe. The recipient of this award demonstrates a valuable impact on their school, church, or organization that promotes good human relations. You should be very proud of your achievements. Amanda is an advocate for students with food allergies. She has been an advocate for all students and their safety in the community as well as in the public high school. Amanda's efforts have not gone unnoticed. Earlier last spring Amanda was instrumental in the decision made by the city of Olathe. She helped to initiate a proclamation from Mayor Copeland and the City of Olathe that May 14-20, 2017 is known as Food Allergy Awareness Week. Congratulation Amanda!!!!! Olathe North High School chemistry teacher Amy Clement has been awarded the 2017 Outstanding High School Chemistry Teacher in the Midwest region as selected by the American Chemical Society. 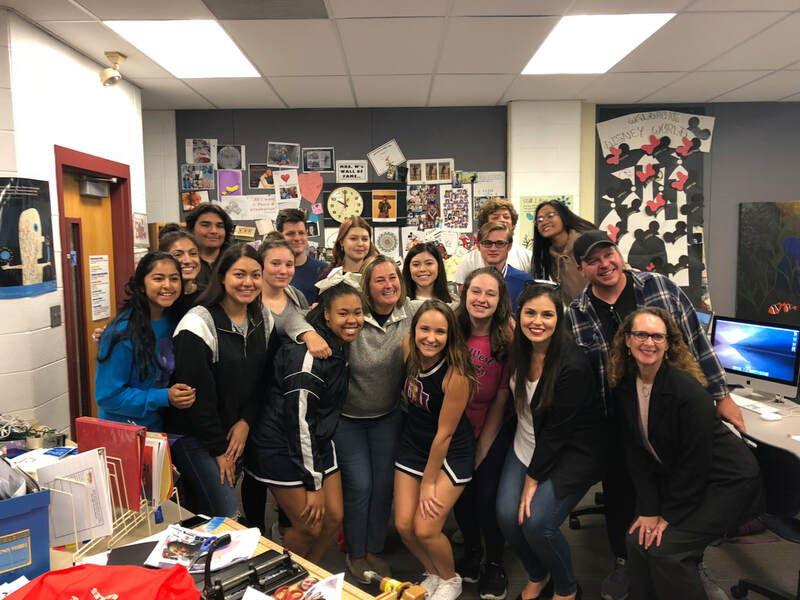 "The staff of Olathe North is very excited for Amy and her receiving the Outstanding High School Chemistry Teacher in the Midwest region as selected by the American Chemical Society," Olathe North Principal Jason Herman said. 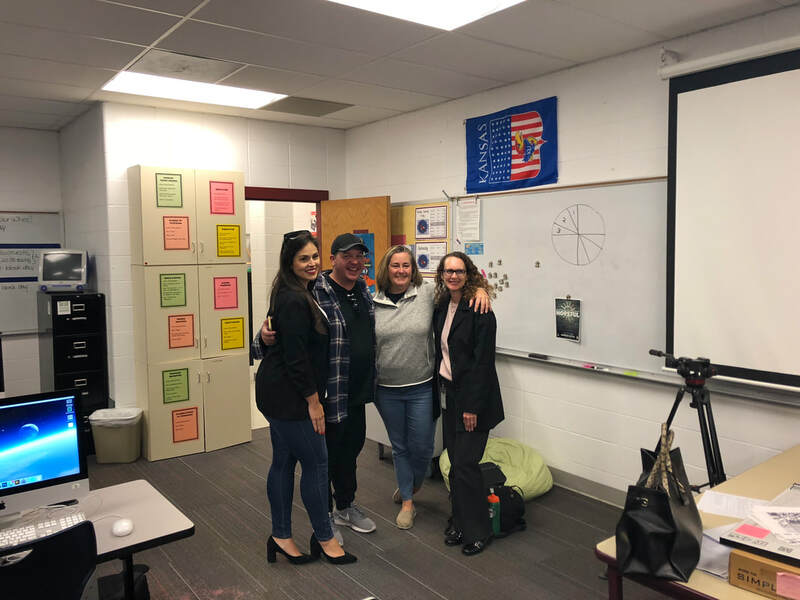 "This is a well-deserved award and it is representative to the high level of teaching and learning happening in the science department here at Olathe North. 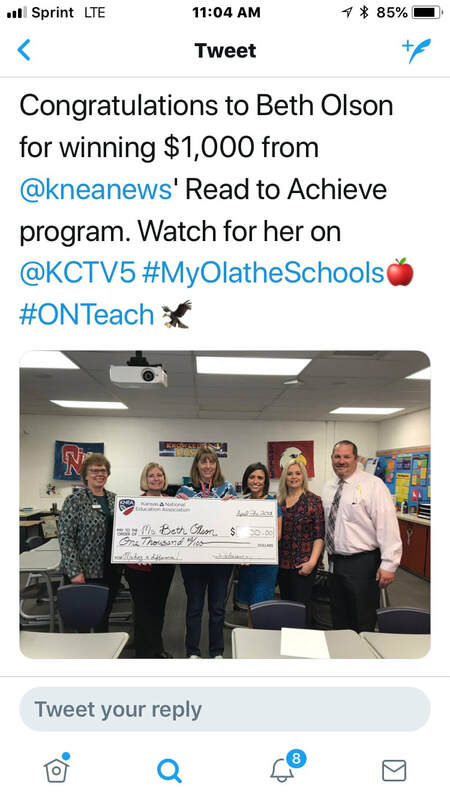 I am personally proud of Amy, not only as the principal at Olathe North, but she is a former student of mine when she was a student here at Olathe North." "I am encouraged that the American Chemical Society recognizes the importance of chemistry education at the high school level," Clement said. "My high school science teachers at Olathe North had a strong influence on my decision to pursue science and education, and my goal is to extend that excitement to the next generation of students." Clement will be honored in October at the 2017 American Chemical Society Award Banquet at the Oread Hotel in Lawrence. Lady Eagles Volleyball Win The Hayden Tournament! The Olathe North Lady Eagles won the Hayden tournament last week. Here they are with their First Place Medals!!!!!!! They went 6-0 on the day! Way to play! The ladies are 14-2 and ranked #4 in Kansas 6A Volleyball. Keep it up ladies!!!!! OLATHE, Kan. -- This week's Reaching 4 Excellence young achiever is so talented in so many areas. Olathe North High School senior Shulammite Lim holds a 4.75 GPA, and that's with taking four advanced placement classes.She's so smart that as a sophomore she scored a perfect ACT score, and got perfect SAT scores on the subject tests in physics, chemistry and math. Believe it or not, those accolades are just the beginning of her accomplishments.The 16-year-old is also a top-level violinist. She plays for her school's chamber and also with the Youth Symphony of Kansas City. She holds the title of Concert Master -- the highest rank obtainable -- with the Kansas Music Educators Association. "I feel great. I can't describe it. Once I start liking something I'll really try to pursue it to the fullest," Shulammite said.Teacher Cecily Mahan couldn't say enough positive words about this week's young achiever. "She's a teacher's dream. She is so great at everything and she is so humble. She's that talented that she can play better than I can," Mahan said. She is also a hand-picked member of the National Association for Music Educator's -- National Honors Orchestra. "November 26th and 29th we'll all be in Disney World in Florida playing violin ostensibly, but probably also going on a bunch of rides," Shulammite said. But her story is not all sunshine and rainbows; she's had to work hard for what she has. She auditioned for district orchestra during her sophomore year- and didn't get in. "I realized that I can't assume that I will get into anything without trying hard myself," she said. She turned what some would consider a failure, into an opportunity. A year later, not only did she surpass that goal, she became the head performer for her division in the state orchestra. "Open to failure, knowing that it will happen but also still striving for the best," she said. Shulammite was selected last year in the music for All Honors Orchestra of America. She played with the best students in the nation in Indianapolis. She is also the recipient of a $20,000 H&R Block scholarship. Pictures from the Senior Signing Ceremony. Saturday was KSHSAA State Solo/Ensemble contest at Washburn Rural High School in Topeka. Congratulations to Olathe North vocal students for bringing home 13 Superior (I) ratings and 6 Excellent (II) ratings. Ensembles receiving I ratings were Northwinds and Advanced Women’s Ensemble. 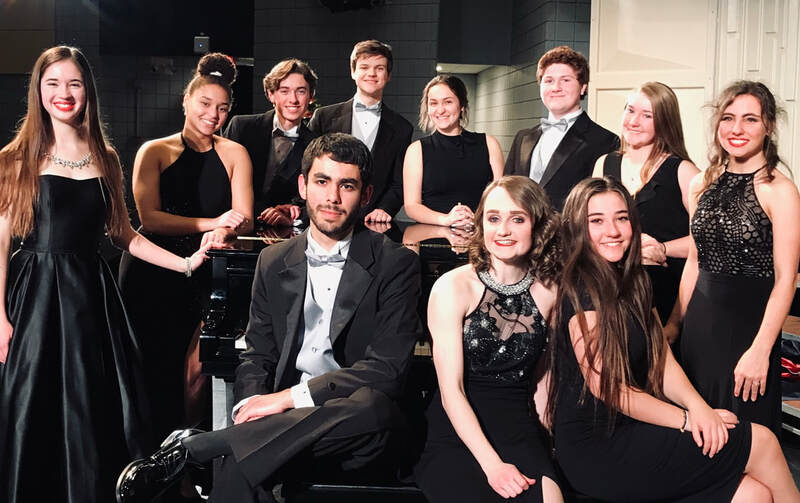 Soloists receiving I ratings were Ashton Gohman, Cole Bellamy, Natalie Crane, Noah Haskin, Paola Ramirez, Hannah Guzman, Allyson Tinker, Naomi Turner, Ashley Strella, Layella Phillips, and Payton Boldt. Ensembles receiving II ratings were Eagle Men, Concert Women’s Ensemble Blue, and Concert Women’s Ensemble Red. Soloists receiving II ratings were Sophie Schulte, Kaylee Hicks, and Kayla Szymanski. Congratulations to the seven Olathe North Students that were recognized as 2017 National Merit Finalists. The poster on the right is what we have hanging in the lobby. Congrats to: Sabrina Bogart, Alexander Kolar, Dylan Honors, Arvid Subramanian, Ethan Johnson, Adam Coffman, and Alexis McCalla. Ana Schulte’s new original work, And There Was Light, has been selected for performance in The Coterie Theatre’s 2017 Young Playwrights’ Festival. Her piece will be presented on The Coterie stage Sunday, May 7, at 7:00pm. Impromptu Graduation: S/O to Dawn Sullivan, Phyllis Clark, and Seth Schwieterman for caring so much for a senior that they encouraged me to reach out to Mackenzie’s father to give her mother a graduation at hospice. See the links attached for the media response. Olathe – Olathe Public Schools Science Olympiad teams recently took the Kansas State Science Olympiad Tournament by storm. Olathe North High School won the C Division for the sixth straight year. California Trail Middle School won the B Division for its second straight year. The Olathe North and California Trail Science Olympiad teams will travel to Dayton, OH, for the 33rd Annual National Science Olympiad Tournament hosted by Wright State University May 19-20. Upward of 7,600 teams across the nation compete for a chance to showcase their talent at the national tournament. Ultimately, 120 teams compete on the national level utilizing knowledge of engineering, problem-solving, technology and process skills. Olathe North Eaglette Dance Team is left Orlando with their first ever national championship title from NDA High School Nationals! After working hard and pushing every day, their dreams have come true and they are walking around in brand new black jackets! Bringing home the very first NDA High School National Championship means so much to Olathe North High School. The team has worked so hard and pride themselves in representing the community.